At Faculty of chemistry and chemical engineering we are working on continuous production of bacteriophages for project RRP6 within BioPharm.Si. Bacteriophages are viruses that infect and kill bacteria. Therefore bacteriophages could represent an important alternative for treatment of bacterial diseases, since bacteria are becoming increasingly resistant to antibiotics. For that reason continuous production could be a good solution for the increased need for bacteriophages in the future. We have set up a series of experiments and wrote a mathematical model in order to examine the continuous bioprocess of bacteria and bacteriophages. We have chosen this system due to its importance but also due to high dynamics of the process, possibility to perform of large number of experiments in relatively short time and thereby a lot of data can be collected. Multiplication of bacteriophages starts with the adsorption of bacteriophages onto bacteria, which is followed by the injection of bacteriophage DNA. Inside the bacteria new bacteriophages are formed and finally after bacterial lysis, progeny bacteriophages are released (Fig. 1). Initially we designed a system for continuous production of bacteriophages that consisted of a continuous flow of substrate into a stirred bioreactor, where bacteria are continuously growing and a continuous outflow to achieve steady-state conditions (Fig. 2). After the steady state was achieved, the bacteriophages were injected directly into the bioreactor. 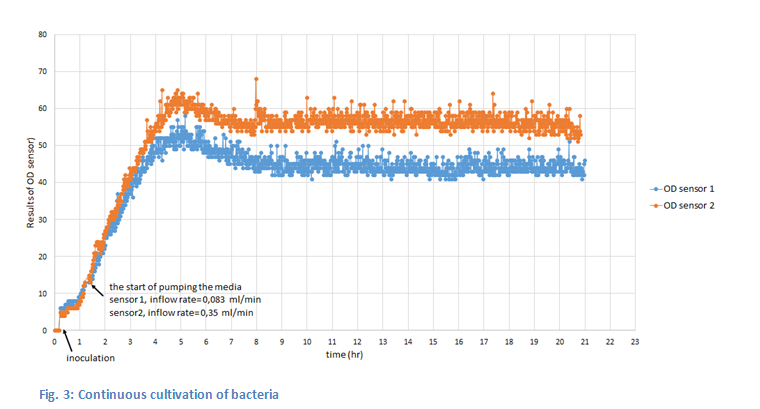 Continuous cultivation of bacteria was controlled with OD sensor (Fig. 3). 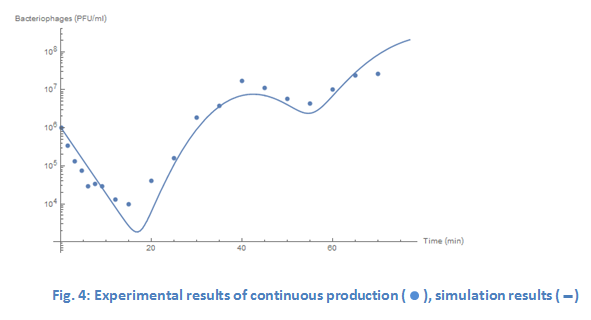 Process was described by a mathematical model matching closely experimental data (Fig. 4). This system was also used for studying the effect of bacteria physiological state on production of bacteriophages . Because of potential mutations of bacteria in the first system, we designed a second system that consisted of two connected bioreactors, with the constant flow of substrate in the first reactor, where bacteria are continuously growing. Bacteria are then pumped forward into the second reactor, where they interact with bacteriophages (Fig. 5). This system is more suitable for continuous production of bacteriophages and it was also used to study the impact of the dilution rate on production of bacteriophages . 2. Nabergoj D., Modic P., Podgornik A., Effect of bacterial growth rate on bacteriophage population growth rate. MicrobiologyOpen. 2017; e558. 3. Nabergoj D., Kuzmić N., Drakslar B., Podgornik A., Effect of dilution rate on productivity of continuous bacteriophage production in cellstat. Applied Microbiology and Biotechnology. 2018; https://doi.org/10.1007/s00253-018-8893-9. 4. Podgornik A., Janež N., Smrekar F., Peterka M., Continuous production of bacteriophages. In: Subramanian G (ed) Continuous processing in pharmaceutical manufacturing. Wiley-VCH Verlag GmbH & Co. KGaA, Weinheim, pp 297-338, 2014.